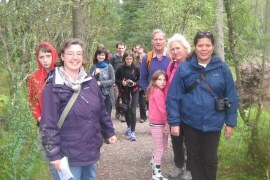 Community artist, poet and composer Petra Vergunst led an unusual walk from the Bennachie Centre, Chapel of Garioch on Saturday 13 September. A leisurely stroll through the woods for folk of all ages, it involved recitations from Petra from her new book of poetry Whispers in the Woods. Her words and music she has composed are an exploration of the history of the lives of the colonists on Bennachie a hundred years ago. The walk along the woodland trail followed in the footsteps of those long-ago colony folk. Many of her poems have been written on stones, benches and tree trunks along the colony trail. Her project Whispers in the Wood has been funded and otherwise supported by the Hope Scott Trust, the Forestry Commission Scotland, the Bailies of Bennachie and North East Writers. After this poetry in motion afternoon the walkers returned to the Bennachie Centre for some welcome refreshments provided by Ann Baillie, a Bailie of Bennachie, and an alfresco concert from the Dee String Quartet, their music composed by Petra. "I have tried to echo the feeling of the woods and the people who must have had a hard life here," said Petra. 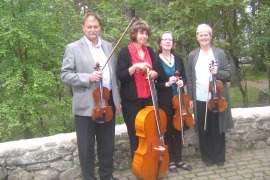 The musicians Jean Fletcher (violin), Shelagh Reid (viola and treble recorder), Dirk Van Loon (violin) and Hilary Cromar (cello) are also much in demand for weddings and enjoy alfresco events. Said Hilary: "As long as it's not too windy because then our music tends to blow away!"